When you picture a deck, what do you think of? There’s nothing wrong with this kind of space, really, if that’s what you’re going for. But before you simply build a deck like this, we’d like to introduce you to a few other possibilities that might just expand your horizons a bit. Deck Design and Construction in the DC Area - What Are the Possibilities? These days, decks and patios are no longer seen as just a square tacked onto the back of your house where you can soak up some sun and eat a hamburger on a Sunday afternoon. They’re typically called “outdoor living spaces” now, and for good reason. Technology, advancements in furniture style and materials, and the awareness of design potential has allowed these spaces to become a real extension of your home. Comfortable, functional, and able to be used for much of the year, you’ll wonder how you ever lived without it. Yeah, you read that right. Technology isn’t typically associated with outdoor living, but in today’s world it’s commonplace. From televisions to thumping sound systems, you can bring your media experiences into the great outdoors, whether you’re throwing a big party of just tuning out so some Sinatra in the early evening hours. One benefit to hiring a professional home building and remodeling company is that you aren’t stuck with just the “easy” designs. A professional can create a space that really flows with your home’s style, is conducive to the size crowds you expect to entertain, has ample outdoor storage options, etc... This is all important to consider in advance. Let’s think bigger than chairs. We can maximize your seating (and keep valuable square footage wide open) by building bench seats around the perimeter, L-shaped seating around corners, etc... More entertainment and less clutter. Depending on the style and level of maintenance you’re okay with, you can discuss deck material options with your pro as well. Concrete and stone is fine for patios, of course, but a deck can be built from a variety of synthetic or natural materials. 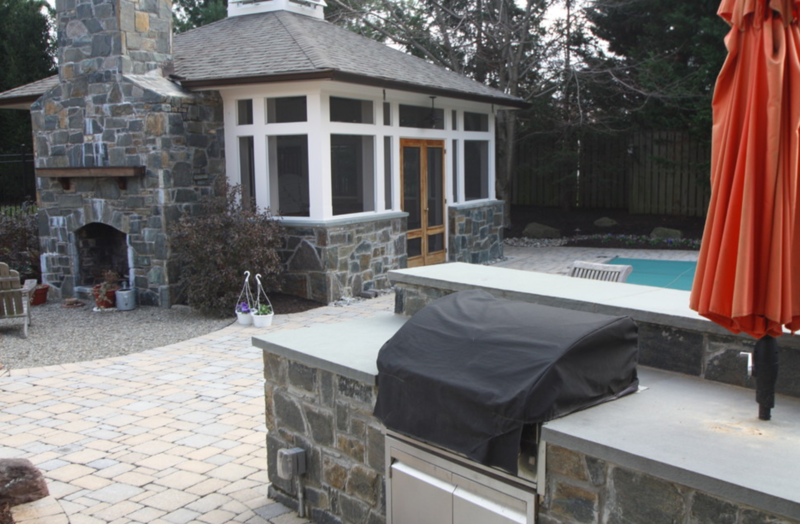 No, it’s not just a “California thing.” Outdoor kitchens work in our climate too, thanks to winterizing techniques and the right construction materials. Imagine having not just a grill, but a full kitchen space so that you can cook, laugh, entertain, and never leave your family and guests. We hope this has offered even just a taste of the potential that your own backyard holds. If you have any further questions about your Maryland and DC metro area home, please contact us at Stohlman & Kilner Remodeling Contractors. It would be our pleasure to serve you!